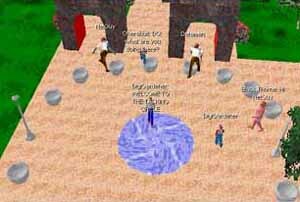 Fifteen brave souls congregated in the digital hinterlands to participate in Sherwood Forest Community Experiment Day One on March 24, 1996. The focus of this day was to see how easy it would be to have a multi-avatar meeting complete with discussions, a flyby of the site and walkthrough of its features and to begin to form our rules of conduct, methods of cooperation and some semblance of a culture of the community. 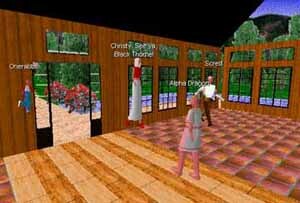 Sherwood Forest was laid out by members of the Contact Consortium using the same avatar and citizen ID. The Consortium then assigned lots to skilled builders and uncovered their portions. This allows simultaneous construction of one site by several avatars! Please find screen shots below in a photo album of the day's events.